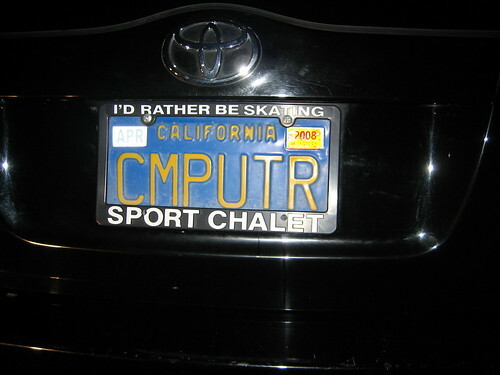 Digital Electronic License Plate | California Hacker's Paradise? Digital Electronic License Plate | California hacker’s paradise? If e-plates become a reality, this plate could well be flashing an advertisement at you. Image from Flickr. The California State Assembly is set to consider a bill in the next few days that would green-light “Digital Electronic License Plate” technology. These digi-plates would turn any license plate into a mobile advertising space, flashing ads if the car sits still for more than four seconds. With no formal opposition ready to debate these plates, are you going to see them on the road next year? What are Digital Electronic License Plates? The bill making its way through the California legislature gives the DMV permission to work with companies creating so-called “Smart Plates.” These digital electronic license plates are essentially small, pre-programmed screens. During normal operation of the vehicle (read: driving along the road) the plate displays the license plate number. Stop for more than three or four seconds, though, and most of the screen will display something else. The idea is that these plates will be able to display advertising, a personalized message, or anything else that can be put into pixels. The California Assembly appears to be set to allow the DELP for one major reason: budget. A $19 billion budget hole has left the state looking for any and every way to bring in extra cash. With more than 32 million registered vehicles in the state, these e-plates would give advertisers millions of new opportunities to pay the state for advertising. These e-plates would also give the chance for residents to pay more money for ultra-personalization on their cars. In short, budget wins. Though the state budget of California may benefit from approving DLEP e-plates, it may eventually cost the state even more money. First, these electronic license plates would change your license plate at the press of a button – certainly attractive to speeders, red-light runners and criminals of all types who could hack their plates to make their numbers obstructed or invisible. Second, would it really be a good idea to turn every vehicle in California into a flashing neon billboard? Which company would want to be “that company” that had the advertisement that caused crashes? Would you want to be subjected to seeing even more ads while taking a drive to the next town? There are also concerns about property rights. Does the state have the rights to sell space on private property for advertisements the drivers wouldn’t make a cent on?